Hydrodif® has the widest range of metric and imperial MDPE compression fittings, PVC valves and fittings and MDPE compression pipes. Hydrodif® also manufacture the unique and approved range of MDPE Universal Transition Compression Fittings, designed to simplify the joining of MDPE pipe to pipe of a different material. These unique fittings dispense with the need for adapters and every standard fitting of the appropriate body size can be converted into a universal transition. Transition from Ø16 - Ø110 to Ø15mm with Ø50mm outside diameter. The Universal Kit covers all pipe types and applications. Look out for the WRAS logo on our approved products pages. 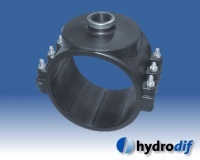 Click here to download our Hydrodif product flyer. A full range of compression fittings for MDPE pipe from Ø16mm to Ø110mm. A full range of WRAS approved MDPE Universal Transition Compression Fittings for joining MDPE pipe with any type of pipe. Transition from Ø16 - Ø110 to Ø15mm with Ø50mm outside diameter. A complimentary range of compression valves, which can be converted to the Universal Transition version. Various combinations available. 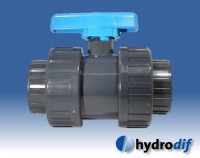 Premium Plast valves are manufactured from Polypropylene. PVC Metric fittings, metric mixed solvent cement welded / threaded fittings. Our stock ranges from 20mm / 1/2" to 110mm / 4" all of which are 16 bar rated. Hydrodif Tank Connectors to connect to or through the walls of tanks, ponds, filters, liners etc. PP Threaded fittings from ½" to 4"
PP clamp saddles from 20mm to 315mm - single & double outlet, reinforced and unreinforced. PP Threaded hose tails. Male and female - straight and 90' Elbow. PVC Valves we supply a variety of PVC-u Metric solvent cement welded fittings. Our stock ranges from 16mm to 400mm all of which are 16 bar rated and are available from 3/8" to 4". PVC-u pipe fittings are assembled through solvent cement joints or BSP threads, both of which generate enduring and reliable joints. Full range of metric and Imperial valves and fittings for PVC-u pressure pipe. Individual special application valves and kits available. Temperature range from 0°C to 60°C. Sealing tape, solvent cement glue, cleaning solvent, pipe clips and all that you might need. MDPE (PE80) water service pipes in blue or black for potable water supplies above and below ground. From 20 to 32mm diameter and lengths of 25 to 100m. UPVC plastic pipes metric and imperial for the construction of pipeline systems for fluids under pressure both for underground and above ground application. Class D and E available and WRAS approved. Repair clamps are used for the permanent repairs of breaks, pitting, cracks and holes on different kinds of pipes like: Steel, Cast iron, Ductile iron, Asbestos cement, PE / PP, PVC, PRFV, Gers, Clay, etc. Range from DN15 to DN1000 in 1, 2 & 3 sections and various lengths. Specially designed fittings for the telecommunications sector.